I is really an accident how I started in crypto. 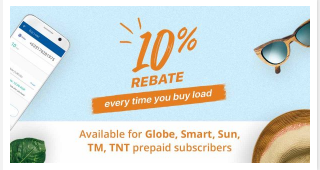 It was september last 2017 I saw the Paymaya ad on my Facebook that says "10% rebate on load when you use paymaya" something like that, I wanted to try it because I have no money that time but I always need a load so I thought that this would really help me because I can save 10% on my every load then I can reload the every 10% gain to myself, then when I was going to download the Paymaya app I suddenly saw the Coins.ph app and also offered the same on loading, the 10% rebate, then I downloaded the coins.ph app instead the Paymaya and there it all began. 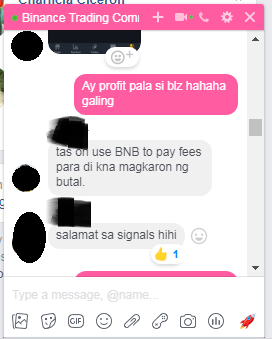 I have a friend who has coins.ph and invested already on bitcoin so I asked him what is that and what's the use of it how it works and how can I profit from it. Then I became curious and I joined FB groups and saw posts on how to earn and stuff like that. 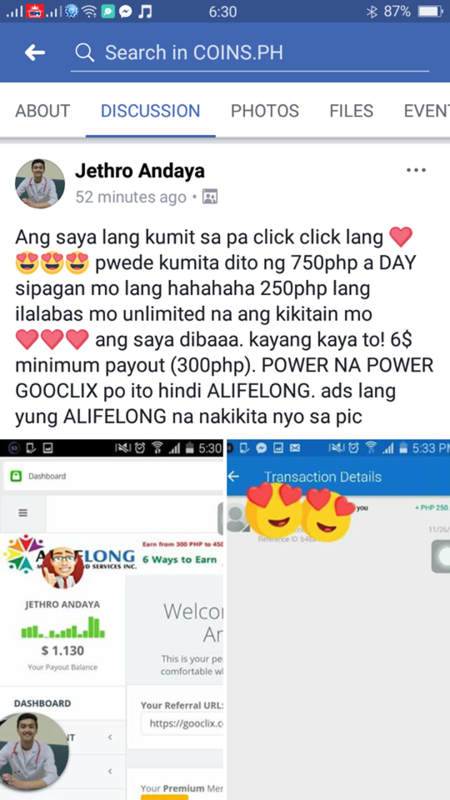 my very first investment was on the inviting scheme, which you will pay 15php then you'll get a code then you need to invite somebody to get 7php for each invited person, it was basically and very perfect example of pyramiding but I need to get my money back so I did what I have to do hehe. but when it encountered this HYIPs the cloud mining the investment programs that promises you big returns, all of my earnings were sabotaged by this kind of SCAMS. I joined the and invested on a lot of scam sites like these and my money is just going out with no returns, the worst that happened to me is the HYIPs I invested in, one is BTCstorm I can't really remember and the other one is Globalhash or globehash i think, I invested on these two and the next day both were gone, It felt so depressing because that is my only money and I am only a student and by that time I am not following the golden rule in investing "invest what you can afford to lose" that's what it felt so bad. but after that I made up my mind that I will not invest anymore and I will start in the free ones, the AIRDROPS, I started I think December and it was tiring and I am impatient so I tried trading. Exactly January 1, 2018 I created my Binance account and immediately deposited 0.001btc and my first coin was TRX which is very hyped back then, I bought it at 0.02$ i think. barely 200 satoshis. I profited from it so I was happy and the feeling was addicting, so I trade every now and then I have a group chat which helped me what coins to buy and also that is the start of my eagerness to learn trading, they helped me and teach me how to trade and the basics, then I go for self studying and in February I met a friend who helped me a lot and motivated me to learn how to trade and to learn technical analysis, But when I am trying to study technical analysis I find it very hard and I stopped and get back to looking for some easy money, then I became a bitcoin broker, what I do is I look for a buyer or seller of bitcoin (bulk BTC ranging from 1 to 100BTC) and the seller or buyer will meet up for the peer to peer transaction, I have a friend that helped me and introduced me to this kind of job, I earned a little from this because its percentage based earning, for example I got a buyer of 3btc then the rate is for example coinbase rate plus 3%, my earning is the 1% or 0.5% of the 3% fee. I remembered I earned 1,400php in one transaction of 1BTC which is not bad so I continued this but eventually I got tired because its not that easy to find a buyer or a seller. after that, with the help of my friend I started again to trade and learn trading and technical analysis. 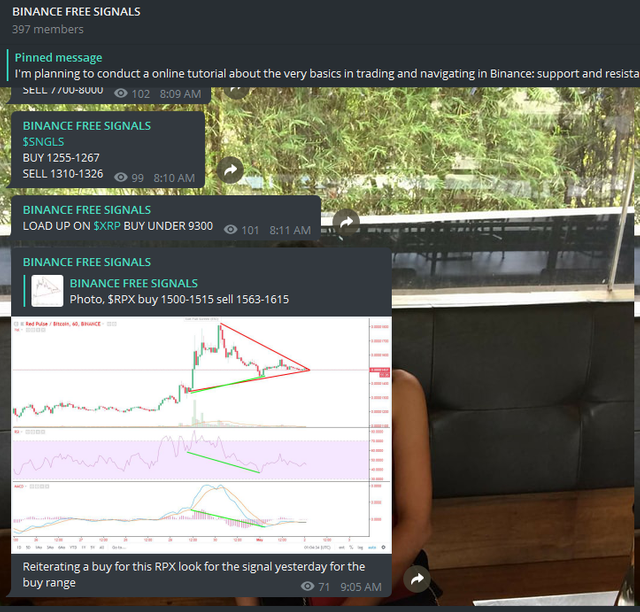 I can say that I learned because my trade calls are on spot, then I tried to share it as a trade signal for some of my GC but they are ignoring it, then I found this group which I was added then I shared my trade calls and they are thankful of it that I am sharing it and from time to time they noticed that my calls are on spot then they asked for more and I am happy because they trust my calls, then eventually I created a Free Signals Channel on telegram that is running until now and from a 10 subscribers it became 370 plus in less than a month, that is why I am very thankful of for that GC. and now I am a blogger here on Steemit and I am very happy that I discovered this so I got to share my story and I hope I will inspire others to go trading instead of the online investments and clicking programs that will sabotage your money. I am also a very proud member of the #steemipowerupph community that gave me a room for improvement and opportunity. "The internet is like an ocean full of edible fish (money) you just need to fund or catch one for you and you can also catch a whale (success) with your bare hands, you just need to put your full effort in getting it (work hard) to catch one for yourself"
and to my steemitpowerupph family!